THOUSAND OAKS, Calif. (AP) — When Clay Matthews knew he was leaving the Green Bay Packers, he immediately told his agent he wanted to play for the Los Angeles Rams. Eric Weddle says he did the same when his time in Baltimore ended this month. Blake Bortles took it a step further: The veteran quarterback was so eager to join the Rams after Jacksonville released him that he says he would have signed even without visiting the team first. “My agent didn’t think that would be the best thing to do,” Bortles said with a laugh. 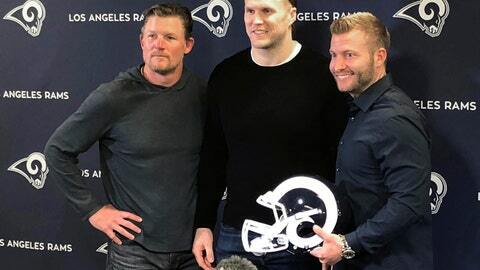 The Rams’ combination of Southern California sun, recent success and Sean McVay has proven irresistible to the handful of veteran free agents who arrived this month to bolster the NFC champions’ roster. Matthews spent Tuesday at the Rams’ training complex, which happens to be about 13 miles from his high school. It’s also a short commute from the new house that the star linebacker was already building for his young family even before his 10-year tenure with the Packers ended. “To be back here now and to be able to play for the local football team and have family and friends (around), to be able to start our family here and kind of plant our roots here, is something that’s pretty awesome,” Matthews said. After reaching their first Super Bowl in 17 years, the Rams have made only a few judicious additions to their roster this month. Along with signing five-year Jaguars starter Bortles to be Jared Goff’s backup, Los Angeles snagged six-time Pro Bowl safety Weddle to take over for Lamarcus Joyner, while Matthews will step into a yet-to-be-determined role as a linebacker and pass-rusher. Matthews started his Packers career as an edge rusher who moved into the middle of the Green Bay defense midway through his tenure. Six Pro Bowl selections and one Super Bowl ring later, the 32-year-old former USC star felt he still had more to do. Although he had a career-low 3 ½ sacks last season, Matthews plans to be a force for the Rams, who could lose Ndamukong Suh to free agency. Matthews expects his position “to be fluid,” but McVay expects him to get after quarterbacks. Matthews was 8 years old when the NFL left Los Angeles, although he didn’t root for the Rams or the Raiders: He supported the teams of his father, Clay Jr., and uncle, Hall of Famer Bruce Matthews. Ever since the Rams relocated in 2016, Matthews had an eye on the West Coast. He savored the chance to play in the Coliseum last season when the Packers lost to the Rams — and now he’ll return to his college arena all season long. “For (the Rams) to come back here, and for it to be so close to home, it truly is a perfect fit for me,” Matthews said. Bortles spent five up-and-down seasons as the Jacksonville starter before the Jaguars added Super Bowl MVP Nick Foles. Faced with free agency for the first time, Bortles chose the Rams even though he wouldn’t be in real competition for the starting job. That’s because Bortles was eager to play for McVay, who fostered Goff’s development and built a dominant NFL offense in just two seasons in LA.